glfw is C a window management library for OpenGL applications, a replacement of the old and well known GLUT and freeGLUT libraries. The library is actively maintained, and shipped with a great set of examples and docs. In this article, we will learn how to setup a OpenGL application easily thanks to glfw, with a simple animation simulating a small bouncing ball. glfw is a C API which relies on callbacks to handle the different configurations, events, errors, etc an OpenGL application would need. Also the multiple resources you may use, such as windows, OpenGL contexts, etc. are managed internally by the library, and it only provides you handles as identifiers of those resources. After that call, the `window` handle becomes invalid, and the window it represents is closed. The point of this kind of design is that the library manages the resources, you only use them. So there are no resource leaks. You can customize the interaction with those resources via the callbacks the API provides. 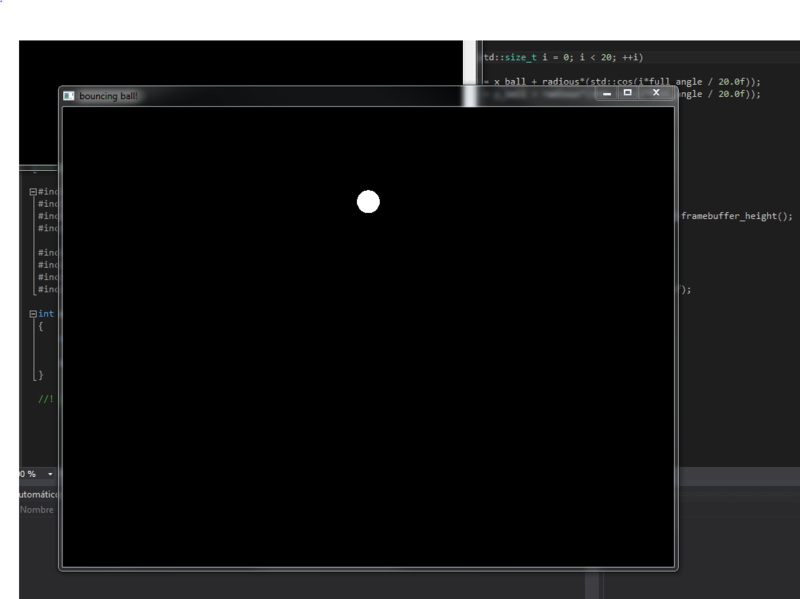 Let's write a simple animation of a white bouncing ball. I'm not a game designer, the goal here is to have the animation working with a couple of lines only. glfw has a C API. That's fine, but I'm a C++ programmer. Let's wrap this API in a simple inheritance-based little framework. What I propose is a simple design to delegate all the repetitive tasks on the base class, and then create a custom glfw-based OpenGL application in a simple way, just inheriting and customizing what you need via polymorphism. This base class is simple: It manages a glfw window and their OpenGL context for us, wraps (and currently hides) the event and rendering loop, finally and provides us some polymorphic functions to say what to do when a key is pressed, when the window is resized, etc. That's all! All the other things (Buffer swapping, window and gl context management, etc.) is done by the base class. How? Let's see it step by step. "Unable to initialize glfw runtime"
"Unable to initialize glfw window"
The class acts as a singleton: There is only one glfw_app instance per application since there's only one glfw application (The app itself). //By defualt rearranges OpenGL viewport to the current framebuffer size. Is not that easy. We cannot just pass polymorphic functions to C callbacks, since they are not convertible to plain function objects. That makes sense, since (even ignoring the dynamic dispatching part) they need an object to be called with. To be able to inject these polymorphic functions as callbacks for the glfw API, we need a bridge between the C and the C++ world. `static` member functions! As I said previously, our app class is actually a singleton. The glfw_app_manager class is the one managing it. Stores the current app instance, registers our bridges as callbacks, and then calls our app functions on them. TL;DR. Show me the ball! We have ball coordinates, ball speed, and its radius. There is also a `gravity` constant, since we want our ball to bounce. The template stuff on the constructor is a variadic template with perfect forwarding, just to bypass all the arguments to the base class constructor. Note how the ball is projected. The visible area of our OpenGL scene (The area which matches the viewport) goes from -1 to 1 in both axes, where -1 is the bottom-left corner of our window, and 1 is its top-left. Working with coordinates [-1,1] makes it simple to deal with window bounds, since they are independent of the window's size. The ball's position and speed are updated following the equations v' = v + a*t and p' = p + v * t, where v is velocity (speed), a is acceleration (The gravity constant), and t is time. Time is measured in frames, so in all the equations t is one. That's why there's no t in our code. If you want a stable simulation (independent of frame rate) you should use a more complex technique, like those described in this article. Also apply gravity. Don't apply acceleration when the ball bounces. biicode is a dependency manager for C and C++, in the same way as pip for python or Maven for Java. They provide a block (package) with the glfw library, so making our example running accross multiple platforms is so easy. Build may fail on linux platforms if you have some X11 libraries required by glfw not installed. They are checked during bii cpp:configure, follow its output if something goes wrong. Also note the code snippets of this article target C++11, so you should use a C++11 compliant compiler like GCC 4.8.1 (Shipped by default by Ubuntu 14.04 and the latest MinGW for Windows), Clang 3.3, or Visual Studio 2013. Finally, if you want to try more glfw examples, the guys at biicode have a examples/glfw block with a complete set of examples extracted from the original glfw distribution. glfw is a great library to write OpenGL applications. Its C API is clear and simple, and making it work in the C++ way can be done with just a little effort. We learnt here how to make a little framework to write simple OpenGL applications in a OO way. Encapsulating the most common tasks in a base class reduces noise in our simple OpenGL examples.